1. Put the potatoes in a pan, cover with cold water and bring to the boil. Simmer for about 15 minutes or until tender. Drain and return to the pan. Stand over a very low heat for a minute to remove excess moisture, then mash with half the butter and 50-75ml of the milk. Season well, cover and set aside. 2. Preheat the oven to 190C/170C Fan/Gas 5. 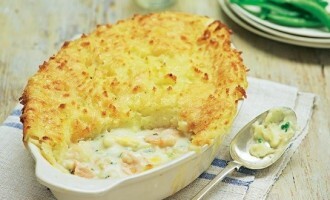 Put the smoked haddock, salmon and white fish in a large, wide-based pan. Add the bay leaf, peppercorns and shallot, and the rest of the milk. Cover and heat very gently until the milk is just at simmering point, then simmer gently for 10 minutes or until the fish flakes easily. 3. Strain off the milk, reserving it for the sauce, but discard the bay leaf, peppercorns and shallot. Skin the fish and break into large flakes. Put in a large ovenproof dish along with the prawns and hard-boiled eggs. Set aside. 4. Melt the rest of the butter in a pan. Remove from the heat and stir in the flour. Stir over a low heat for 1 minute. Gradually whisk in the reserved milk, then bring to the boil, whisking, until you have a creamy sauce. Season to taste if necessary (the smoked haddock will be salty). Stir in the parsley and dill. 5. Pour the sauce over the fish and mix together gently with the lemon juice. 6. Cover with mashed potato and sprinkle with grated cheese. Bake for 25-30 minutes until the top starts to go golden brown and bubbly and the pie is really hot.